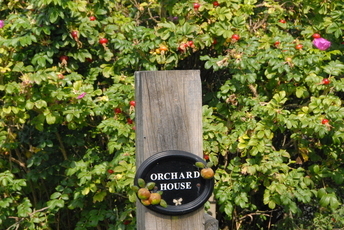 Orchard House Luxury Holiday Cottage Bideford, Chiddlecombe Farm North Devon. ORCHARD HOUSE LUXURY HOLIDAY COTTAGE (Dog friendly) Come and enjoy a break in our traditional barn which has been lovingly converted into a stunning, spacious and beautifully furnished countryside retreat. It's the perfect place for you to relax, unwind and explore all that North Devon has to offer. Dogs allowed max 2 unless by prior arrangement. 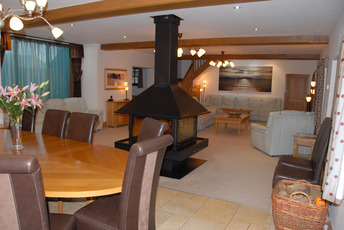 Relax in the spacious, light and airy lounge, with modern central wood burning stove. The large, stylish kitchen with double range and granite worktops is the place to gather for a leisurely breakfast, or escape into the cosy study with its 40” plasma TV and Playstation 3. 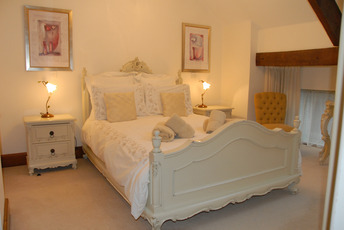 There are four spacious en-suite double bedrooms furnished with designer fabrics each one with a unique theme - French, rustic Mexican, mahogany sleigh bed and one with a contemporary nickel bedstead. 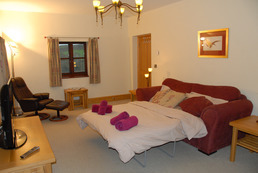 Spacious, modern open-plan living/dining room with central wood-burning stove and 50in plasma TV. Well-equipped kitchen with large range, granite work tops and central breakfast bar. Utility/toilet/boot room. Study with sofa-bed (for +2) and 40in plasma TV. Entrance hall/cloakroom. First floor: Four double bedrooms each with a 5ft bed and en-suite shower room with toilet. 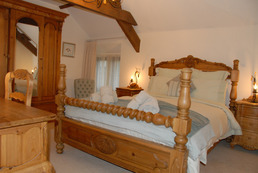 Two twin bedrooms with shared bathroom with shower over a Jacuzzi bath and toilet. All bedrooms contain a plasma TV. On summer evenings, dine al fresco on the long stone patio running the length of the barn, with patio table and chairs looking out over uninterrupted views. Surrounded by 20 acres of shared woodland and meadows containing shared tennis court, games barn with table tennis and pool table, and children’s climbing frame, swings and slide. The sandy beach at Portledge, is just a 40 minute walk away, (accessible from 2nd Feb - 31st August only) – well off the beaten track. The Atlantic Village Outlet Shopping Centre, which contains a large supermarket, is just 2 miles away. For more information on the local area and things to do please click here. Shared external games barn with table tennis and pool table. We had such a wonderful holiday. The pictures do not do the home justice as it is so clean & comfortable. If only we could have stayed longer than a week. Thank you to the owners for keeping such a beautiful house.